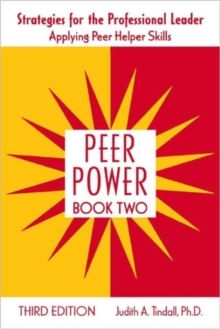 The Peer Power Program is a peer training program designed for middle, high school, and higher education students, focusing on 8 core skills: Attending, Empathizing, Summarizing, Questioning, Genuineness, Assertiveness, Confrontation, and Problem Solving. Through a series of exercises, games, and self-awareness techniques, youth and adults involved in the program can gain the basic communication and mediation skills necessary to effectively help their peers. The professional strategies book provides the program leader/facilitator with clear and easy to follow guidelines for implementing the Peer Power Program. Picking up where Book One left off, the leader's guide to Book Two proceeds through the same series of Modules that are found in the Book Two Student Workbook. For each exercise in the student Workbook, this leader's guide provides instructions for introducing and implementing the exercise, time and material requirements, description of its purpose and goal, and application assignments. Equipped with the professional strategies book, the program leader (teacher, school counselor, juvenile center officer, mental health professional, and human resource professional) can quickly and confidently work through the Peer Power curriculum.